Most cities wait like hopeful dancers at a school ball. Others get up and ask or just start dancing, like West Palm Beach, St. Louis, and Everett, Washington, profiled in its local newspaper, The city plots the next stage of its downtown renaissance. 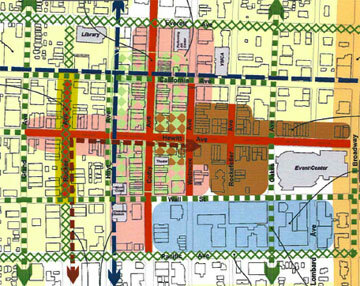 The map shows strategic investment areas that the City of Everett (within the Seattle metropolitan area) is proposing for its downtown plan. Incentives include promoting greater residential densities downtown, sponsoring a model project (a CoolTown strategy), investing their own $ in public places to inspire complimentary buildings, eliminating minimum parking requirements, and providing a vision from its community. The vision statement includes language like, “Downtown is a pedestrian friendly, active neighborhood where people are prioritized over accommodating the automobile. The city center has a lively atmosphere on weekends and in the evenings, as people come from surrounding communities to enjoy the arts, entertainment, cultural offerings, dining and shopping opportunities year round.